Well its been a long week and while I have wanted to update a few times this week, I just haven't. Lots of changes have headed our way and we still have more to come, but we will adjust just as we have to everything else. Emily overall has had a good week, she is still eating really well but still losing weight (back to 25.9 lbs) and handling it all really well. As expected her counts are zero this past week (or to be exact .2), which means she is neutrapenic, so homebound we have been. This weekend we were going to go school supplies shopping for the girls, but with Emily's counts being low we have to stay away from the stores. We hope to get it done once her counts come back up, so hopefully later next week. 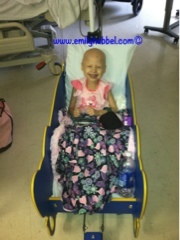 Emily had clinic twice this week, and both times she needed platelets since they have been low. Thankfully she hasn't needed blood since the week during chemo, but have a feeling it will be sometime this coming week she may need blood.Monday she also received her shot in her leg for neulasta. Thursday she had to be accessed twice though because the first time, she was crying it was hurting waiting for her counts to come back, so Elaine (Emily's nurse) had to deaccess her and we waited for counts to come back. 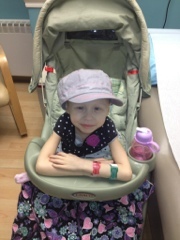 When they came back, she had to be accessed again since she needed platelets again. Emily has clinic on Monday again for counts check. Friday the sitter called me at work to let me know that Emily was complaining that her toes were hurting. She tried a warm tubby and some tylenol, but still later was complaining that her toes were hurting and she was crying. Daddy went out and got her footbath with bubbles and warmer with some epsom salt. We did try that last night, and she said it helped a little. She woke up a couple times from sleep complaining her toes were hurt. Spoke with Dr. Sholler and she recommended stopping the nifurtimox for 2 days, so she will start that back up on Monday if her toes are not hurting. We did finally hear from the scheduler yesterday afternoon and Emily will have a complete re-evaluation when we go back. Emily is scheduled to be back in Michigan the from September 5th - 7th with MIBG fused with CT scan, Bone Marrow, injection, meeting with Sholler and hearing test (we haven't had one of those in a year). So I started working on getting a flight on Thursday since I had known we were going to be there Wednesday and Thursday, just didn't have the rest of the information. We love Wings of Mercy and they have been amazing to us, but I did hear back from Sharon from WOM and she told me because the week we need to be in Michigan is a holiday week, she still hasn't heard from anyone who was willing to take the flight. Not exactly what I wanted to hear, so she asked me to start looking for a 2nd option. So, Monday I am going to check with a few others, but we are thinking if we can't find a flight, we may have to drive Not exactly what we want to do right now, with gas going up and I even noticed yesterday it had gone up about 10 cent over night, so we are really hopeful in finding a flight. Gas in Michigan is also much higher as well, so we are hopeful. I also need to call Monday and get the Renucci House set up. We will keep you guys up to date, on how things are going with that though. 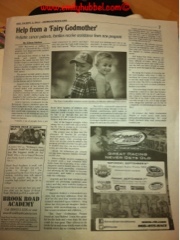 Also last week the Henrico Citizen ran an news update about Fairy Godmother Project and about Emily. I will post it on www.emilyhubbel.com. 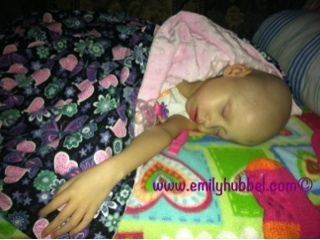 We will keep you guys updated on how Emily is doing and flight to Michigan. Remember to always hug and love your kids. It is hard to believe that today Emily finished the 6 round trial of Nifurtimox, it was a long 6 rounds. Overall she had a good week, she had a day where she didn't eat much and fell asleep early and a night where she felt like she was going to get sick. But overall, she handled the week really well and in Emily style, with a smile. Thinking just one year back, Emily had just come home from her 1st transplant on August 8 and would be admitted September 7th for her 2nd transplant, hard to believe one year has passed and Emily is not completed with treatment yet. Thinking back during that time, was really hard for us, with Emily being at the hospital for 3 weeks both times and not getting much family time together. It was just Doug and I doing all the work to keep our family together as much as we could. Just so hard to believe that we are one year passed this. Her counts have already started to decline, but that is to be expected and we expect to see them hit rock bottom come Monday. So, we are being extra careful, because we don't want to see her like she was Round 5. For 2 and a half weeks after Round 5, she was down and spent a lot of time on the couch. Today we both went to clinic, because we were supposed to meet with the Education Liaison through the hospital, for some reason she didn't make it in. After speaking with a few people though, many think it would be better if Emily didn't go on the first day of school and especially if the Education Liaison hasn't talked with the class. Doug and I talked about it and we agree, because the first day is a bit hectic and we would really like for the class to be talked with to understand about Emily. Doug and I are both nervous about Emily starting school, but she wants to go to school and we want her to go and things be as normal as possible. We are still waiting on confirmation of dates that we will head to Michigan, and also waiting to hear if Emily will need a complete re-evaluation with bone marrow biopsy and the whole 9 yards. 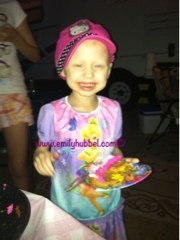 Emily will also have a hearing test next month as well, since it has been about a year since she has had one. Just wanted to give a quick update of Emily and how she is doing, she is already asleep tonight beside me and Brianna is trying to fall asleep. It has been a long week and we are looking forward to hopefully sleeping in and just enjoying time together as a family at home. Tonight she will get her last bag of fluids, and then tomorrow I will deaccess her. Its hard to believe that Doug and I have had to learn to be nurses at home and take care of Emily, but we do it with ease. It was never something we thought we would do. Emily will return to clinic on Monday for counts check and neulasta shot, where it may be a possibility that she will need platelets. We will continue to keep you updated, please hug and kiss your kids and tell them how much you love them. 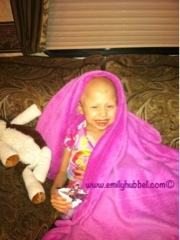 Day 1...mommy went to work yesterday and Daddy took Emily to clinic for chemo. Mommy has a hard time when she is not there with Emily, but I know she does just fine, although she didn't want me to go to work yesterday, as I was deaccessing her in the am before I left since she had been accessed for 7 days. They wanted to give her a little break (3 hour break or so) to access her again which will be for another 6 days. She did great with daddy and Daddy did well with the accessing for Emily! Emily is still on her antibiotics and as of right now they are scheduled to be completed tomorrow evening unless we find out differently. Since she started chemo yesterday, she will also be on fluids for the week ending Friday evening. Emily is 27 pounds which is awesome, she has gained some weight, we are hopeful we can keep that up. Day 2...mommy took Emily to clinic and today was a really long day! Chemo finished in good time but because her hemoglobin had dropped they wanted to give her blood! She will probably need platelets tomorrow! She has 3 days left! Emily is handling things well though and we did tell her the good news we received from VCU and that she only has this last round of chemo and then some more treatment that wasnt chemo! Did learn today that Emily will go for follow up Mibg scans with dr Sholler during the week of September 3rd! It's a shame it has to be the first week of school but we are hoping that Emily will at least be able to go to school on Tuesday the 4th with Jessie and then we leave the 5th! However we just don't know yet! Then again depending on her counts she may not be able to go on her first day of school! School right now is the other part we are working on! I did talk to the school and they understand the situation and also understand that Emily will not be able to have updated immunizations so we have to get the medical exempt form signed along with homebound! Dr Gowda did tell us that right now Emily probably won't be able to make it a full 8 hours of school either! Brianna too will be starting daycare in 2 weeks at Emily's old daycare! They are such a great daycare and have been so good to us! We did get Emily's wig in last week and it looks great on her, but the hair is pretty long so we need to go somewhere and get it cut and also figure out how to get Emily to like it and wear it with no problems! So far the first 2 days are going well and Emily is doing ok! We will continue to keep you updated! Jacks parents were told that they have no other options for Jack! 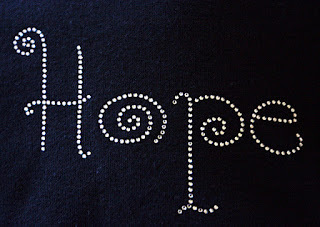 This disease is terrible and breaks my heart! We have never met this family but they are constantly thought of, please leave them some love! Thank you to our besties Sue and Jojo for treating us to Yogi Bear in Luray and even better that you all joined us in the celebration! We enjoyed a weekend away with all the kids and our besties! The weekend was too short and we wish that we had longer to stay with our besties and the campground! Thank you guys again for supporting us along the way and continue to do so and traveling 5 hours to visit! You guys are pretty amazing and we really Appreciate all you do for the Hubbel Family! Tomorrow starts round 6 -- the final of this trial and then we head back to Michigan for scans! We are ready in some ways to get this show on the road and then in other ways we are not! But school starts after Labor Day so we hope she can start with the rest of them! Hopefully the scans can be done before that but we will see! Although as for now we are not as worried about the scans but we are pretty sure we will see some residual disease but surely not as much! So thankful this seems to be working! Just a quick update and we will continue to let you know how the week goes with her chemo! Make sure you hug and kiss your kids and tell them how much you love them! Well we are home! Emily is already asleep on the couch! Her spots are still sore but dad and I will be keeping an eye on them! She will be home on IV antibiotics for a few days and needs to be back Friday to check her platelet counts bc they dont want to ever let them get as low as they did before! 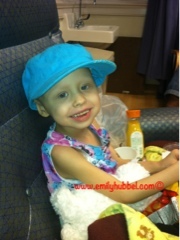 Emily did great on her Mibg scan today...we don't have any results yet, but fingers crossed! Just happy to be home together! forward with the MIBG scan! I have forwarded over his email to Dr Sholler and waiting for her response! I also sent them an email of Emily's updated photos of her spots! At this point we are waiting for direction from Dr Sholler but to say we are devastated is a complete understatement! We are scared! I know many of you are looking for an update to see how Emily is feeling, texts, questions, emails and we haven't responded... We really haven't been up for much talking lately, so if you have called and/or we didn't respond to texts or emails, we are sorry! Well, I wish I could say that there has been change of some kind, but in all honesty there really hasn't been any change. The major change would be that she is having pain along with two of the spots that she says hurt to walk. We can't figure the pain out, but if you touch them she screams in pain. We have tried ice, heating pad, frankencense, emla cream, but really nothing seems to help. The time she seems at most comfort is when she is asleep, as long as you don't touch the spots. She still has the four spots, and while 2 of them seem to look better, the other 2 actually look worse, bigger and swollen. While we know they are not bug bites, because there are not actual spots to look like they are bug bites, we just don't know. The pain has been horrific at times and enough that we have had to start the Tylenol with Codeine again today from when she had her bone pain last week, but she mostly has been sofa bound or in the bath or shortly in the pool. She said they don't hurt as bad in the water. This weekend has been really hard on Doug and I, mostly because of the pain she seems to be in and we don't know how to help her to make it better and really just what is happening. We have been home all weekend, while most of it has been seeing her in pain, and this is really hard on us. The pain she seems to be in is really scaring us. At one point, we almost emailed Dr. Gowda, but she doesn't want to to go the ER. On top of the weekend, Thursday we had a pretty bad storm and we lost Comcast so we haven't had any internet, phone or cable. I did speak with Dr. Sholler on Friday, and she too is concerned about the spots on the skin. She said the bone pain she really thinks most of that is from the Zometa. She requested that Dr. Gowda get a LDH and HMA/VMA. Which they were done. (Thankfully Friday afternoon Dr Gowda emailed and said that the LDH has come back normal and that the HMA and VMA should be back Monday or Tuesday) She also said please don't cancel the MIBG scan as of yet that you all have there, but I am going to start working on getting one in Michigan. The concern would be that if this is truly progression, Emily would need to have the MIBG scan there to qualify for another trial there and insurance may not approve two MIBG's so close together. She said that she wasn't real sure about getting Emily in this coming week because she has quite a few kids coming in, but she would see what she could do. She said she has hopes that the spots are only infection, but that she couldn't lie and say she wasn't worried that they are anything else. As of right now, she wants to play it out and see what happens at tomorrows clinic appointment and then go from there. So, its really a possibility that we could be making a trip to Michigan. As for Doug and I, we have tried to read and read and find information, but we have been unable to find anything much really. What we really found is that with the skin neuroblastoma is only 12% that get it and mostly found in infants. So we have to look at it that the possibility is 50/50 chance. Yesterday I think I tried to read and find out about information, that I just had to get away from it, because it was really starting to drive me crazy and the anxiety was building. I have received a few messages again and instead of replying to all of them, it is easier just to post so that you all know... but most have been asking what would be helpful during this time... gas gift cards in the possibility we have to travel, donations by clicking here...others are asking what is Emily into these days and honestly she has been into her finger nails, painting and her Nintendo DS 3d. Chemo should have been starting as a possibility of tomorrow if her ANC was ready for the last round of this trial, but Dad and I will not allow her to start with these spots and not knowing what they are. Dr. Gowda also indicated that right now any thoughts of a biopsy is not good because of low platelets. She is still off the Nifurtimox until we know what is going on and Dr. Sholler is agreeable with this. 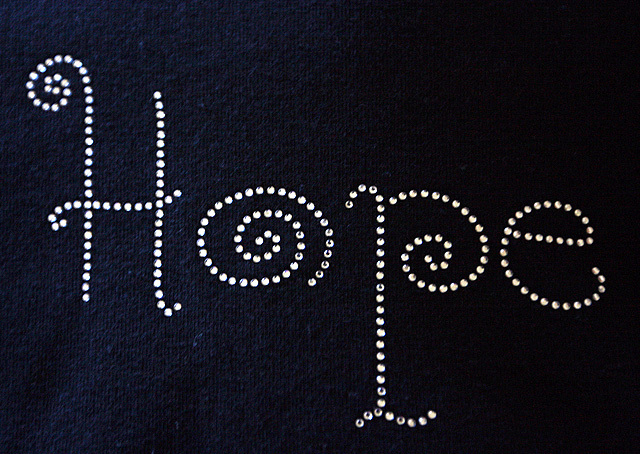 Tomorrow is a new day, and the hope is that they are better, almost gone and Emily be moving forward. Please send your thoughts and love. Also this week I will be trying to work on finding a place to get VA Blood Services out and have a day where people come and donate blood or platelets in honor of Emily (Thank you Mary Ann for getting a number for Emily). We will update you all as we know more information as to what is going on. Make sure you hug and kiss your kids everynight and tell them how much you love them. Our stomachs are in knots, our hearts are heavy and our fear is high! It feels like in the past week and a half we have been on a major roller coaster ride one where when it rains it pours! Ups and downs and never knowing when it will just stay level. Emily had clinic today and the visit didn't go as I thought it would. So much so that after clinic I asked my boss if I could work the rest of the day at home! I was just expecting a normal visit to check counts and then take Emily home and then head to work. The past few days Emily has had some (4 to be exact) red/purple nodules develop on her skin on different parts of her body. I explained them to the nurse and she told Dr. Gowda about them, who came and looked at them Emily says they don't itch, they hurt when you touch them. Some of them since we have been watching them have gotten bigger and some are lookinh darker! Dr. Gowda also looked closely at her leg where it has been hurting to touch. She is still complaining it hurts to touch, but other than that, she is walking ok. He thinks that the leg hurting, the headache and ears could just be from the Zometa, because it does cause bone pain, but it still makes him wonder some. He is showing some concern about the 4 spots that we showed him this morning. As of yesterday she had 3 spots on the skin that are redish purple and a new one showed this morning before we left for clinic. 3. Progression...these spots could be what they call "blueberry muffin" spots! He said all of these could be painful to touch! Our minds are all over the place right now! Emily didn't need any blood products today so Dr gowda took us out of the fish bowl and into a room! This really scared me, but he wanted to get a closer look at Emily's spots and also see If there was any others! He also said that he has requested an Mibg scan next week so we can see what is going on and showed me what a "blueberry muffin" spot lioks like! He said if the spots are gone we can cancel the scan but he wanted to have it scheduled! Elaine, our nurse also drew more blood to do a d-dimer test! This is to check for blood clotting and he would be able to see by the number if that is causing the bumps but this was the lowest of concerns on his list but he also couldnt put it aside! We know that Dr Gowda is concerned because he said before I left if you have any concerns or any other spots show up or problems, please email me directly and I will call you! Dr Gowda emailed tonight and said the d dimer was negative and that the Mibg had been scheduled for Tuesday and Wednesday! No affirmative time until we hear from radiology! He did email Dr Sholler this morning to advise her of what has transpired at this point and that he had requested for a Mibg here in va unless she wants us to come there! We have not heard a response back from her yet! So our biggest concern is that these spots are NB! We have taken Emily back off the nifurtimox for now because if she is progressing they will pull her from the trial anyway! We are stopping everything else until we know what is going on! If there are any NB moms, dads or grandparents that have had any experience with this, please let us know! We are beyond scared and worried and the anxiety is taking the best of us! This brings our talks of where she would go for treatment if this is our worst nightmare for the 3rd time! Our hope is that these spots go away as her counts go up! Today WBC was only 500 and her ANC is only 200 so we were told Emily is still neutrapenic so to still watch for fevers and because platelets were 20 to watch for any bleeding or bruising! Please send your love and thoughts that this is just an infection! Remember to hug and kiss your kids every night and tell them how much you love them because you never know when things can change! We will continue to keep you updated! Im sorry if we don't answer calls or texts but right now we are just taking all this information in and trying to understand! We have no idea where things can be next week!